Jana Haren was born on the planet Akiva. Her mother died a few years after she was born, so she grew up with her father, a local renowned archaeologist named Lon Haren, expert on Ahia-Ko history and ruins. He was a suffering of a degenerative disease, but managed carrying on thanks to his strong determination in caring for his daughter and his passion for his job. One day a Jedi came to see him to discuss about his work on some archaeological findings, and after the meeting he revealed to the man that he had felt that his daughter was probably force sensitive. Jana’s caring father denied the offer of the Jedi, who wanted to take his daughter away for Jedi training, and so the Jedi left. In time, however, his illness worsened, forcing him to face the crude reality of his imminent departure. At some point the Jedi returned to visit him, and this time the Lon opted to send his daughter with him to train at the Jedi enclave of Dantooine, that had recently been reestablished. Soon after arriving at the enclave, she started manifesting the early signs of her innate force sensitivity, and so it wasn’t long until she was initiated. Her training proceeded well as she grew up and her masters became fond of her constant enthusiasm on learning new things. She was apprenticed to master Jos Darrst, who chose her because of her talent in the healing arts. During her time as Padawan, she also showed a great talent in piloting, signing up for the local ace squadron and later on taking an active role in the frontline situations, where she would be sent as part of a jedi team, in order to heal injured soldiers and protect the healthy ones. 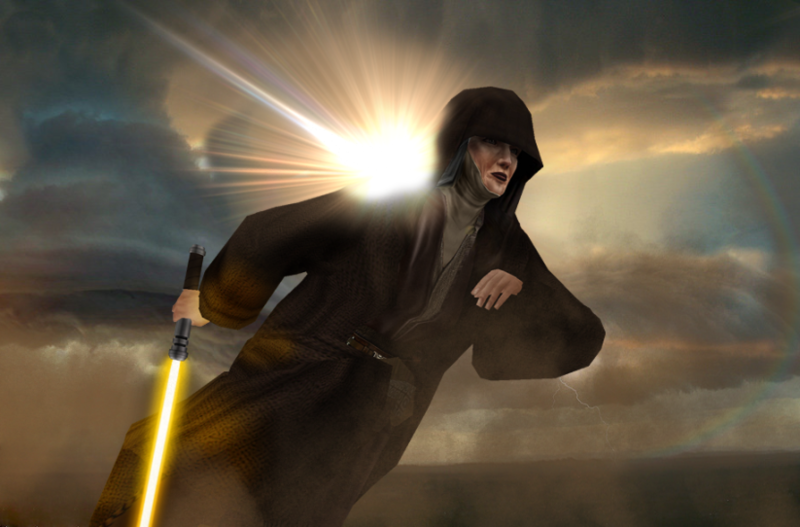 Her actions were soon recognized with commendations and the recognition as Jedi Knight by the local Jedi Council. Sometime after her knighthood, she took part to a mission where two of the four members of her Jedi team died in unfortunate circumstances. They were very close friends to her, and it was hard for her to come to terms with her loss. In order to relieve her suffering, she was offered a transfer to a different branch of the Jedi Order, so she accepted and traveled to the Rannon Praxeum for a new start.